The protests were instigated by the resignation of the National Expert Group working on curricular reform, due to political pressures coming from the new government in an attempt to reverse the reforms. The curriculum reform is just a small part of the reform of the school system which is, in its turn, just a part of a comprehensive strategy on education, science and technology, adopted by the Parliament in 2014. The strategy in general is being implemented slowly, and while the curricular reform in particular has made the most significant progress, it has also brought about protests. The main objection lies in the fact that the experts implementing the reforms - elementary and high school teachers, professors and researchers - were appointed by the previous centre-left government, and are thus considered too liberal, i.e. not committed enough to "patriotic causes". And this is where school subjects like History and Croatian language and literature got caught in between the censorship scissors, and the previous clashes on health, sexual and civic education between the Ministry of Science, Education and Sport and civil society organisations were only augmented. Curriculums suggested by teachers from all over Croatia aimed to modernise schools as places that could keep pupils open to the possibility of changing and improving their skills, attitudes and values, as well as reorganize their workday in a more flexible and autonomous direction. More than 400 professionals, closely connected to their working collectives, decided to reform the Croatian school education system based on the needs of students, teachers and parents. Also, the curricular reform is an issue where "liberal" and "radical" left tendencies clash. For some, the curriculums suggested that the educational system serves as a field for obtaining marketable skills and students are perceived merely as a labour force, not taking into account their unequal starting points. Without questioning religious dogmas, the neoliberal market and the distinct form of capitalism developed in Croatia - as well as without the development of the pupils' perception of workers' rights and alternative forms of democracy - the curricular reform could not gain support from these groups. The idea that politics has nothing to do with education, carried out by the leader of the Expert Working Group and accepted by many, triggered particularly negative remarks for being naive and impotent. After the appointment of the new government, the Ministry only nominally supported the curricular reform. Guidelines of the newly formed government implicated a plan to stop the reform – later it was called a "slip", followed by minister Predrag Šustar's statement that it would be possible to postpone the reform – but "there is no need for that". Consequently, the state budget guidelines for 2016 were published, and they showed no sign of the curricular reform. "We have European funds", it was claimed in a response. And finally, the official statement of the Ministry was issued, which stipulated that the withdrawal of money from the European funds – for which the Ministry itself is responsible – would not happen until the start of the test implementation of the curriculum. Disputes erupted after the Parliamentary Committee on Science and Education concluded that the National Expert Group in charge of the reform should be expanded with ten new members specialized in other fields. The problem with such a decision lies in the fact that the curriculums are being altered by teachers who have created them after a process of public consultation, and the Expert Group is supposed to be there only to organize and support the process, not to intervene in the content. That conclusion revealed the government's absolute ignorance in the matter of the curricular reform’s process, as well as the fact that the conservative movement, now the majority in the Parliament, gained too much power in a secular society. Their executive forerunner is the Minister of Culture Zlatko Hasanbegović. His current ministerial moves, apart from conserving the national identity in culture and arts, are hitting down hard on all dissenting voices – the media, the NGO's, student groups, progressive culture – and their liberal tendencies, rights and struggles for the common good. The situation in the Croatian media has worsened ever since the new government took power, largely due to the activities of the Minister of Culture, who is directly responsible for the media sector. Apart from eliminating funding for non-profit media and cutting the ministry’s support for government-critical media, Hasanbegović also played a role in the resignation of Mirjana Rakić, head of the state's regulatory body, the Agency for Electronic Media. In March, the government majority in the parliament removed the general director of the Croatian Radio -Television (HRT) from duty, and replaced him with Siniša Kovačić, the president of a minor, conservative journalistic association. In less than two months more than 70 journalists, editors, directors, managers, cameramen and others have been removed from their positions or laid off from the HRT. The cultural and civil society sector in Croatia has been paralyzed since Hasanbegović's instalment – the executive boards of independent public foundations (National Foundation for Civil Society Development and Kultura Nova Foundation) have been dissolved, and both will soon have appointed rather than elected directors; the allocation of public funds in the cultural sector took place without taking into account the opinions of the independent cultural councils; the small structural support of non-profit community media was shut down; new regulations and laws which put decision-making firmly in the hands of the minister are being passed. In comparison with 2015, the National Foundation for Civil Society Development received only half the funds, which pushed its activities to the edge of viability. Adopting such a regulation means a 50 percent cut in platform support and shutting down numerous programmes civil society organisations run in dealing with the most vulnerable groups - the disadvantaged, the poor, the elderly, the disabled - as well as those engaged in cultural activities, such as amateur sport, voluntary societies, informal education, environmental justice, volunteering, civic organisation or the campaigning for rights. However, the educational system in Croatia is often an obstacle for those interested in a wide variety of issues and topics - an intimidating system that tolerates but does not encourage its users to become informed. The educational system provides its users only with institutional culture and art, and its users are not formally informed about the existence and relevance of contemporary cultural practices. The needs of the society, in the Croatian context, were met in 1991, with an independent state, and everything after this period is treated as insignificant. Some of the most prominent opponents of the curricular reform proudly affirm this stance. 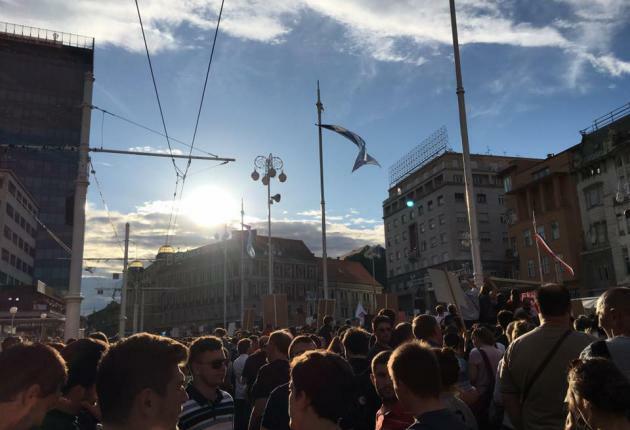 This is why the amount of children, youths, high school students and undergraduates, who flooded the streets of Zagreb on June 1st was a genuine surprise, a victory in itself. It showed that something in that system worked. It didn't take long to find out what that was – as 50 thousand people cheered and applauded every time the word "teacher" was mentioned. Teachers, the base. Does culture as a sector of governing every-day experiences have a base? Why didn't Hasanbegović's moves - shutting down the support for non-profit media, exposing the state's regulatory body for electronic media to pressures, paralyzing a national foundation for civic culture, the intent to ignore suggestions from expert councils and then accuse them of shaming the good name of the Ministry of Culture, as suggested by the new Law on Culture Councils now in public consultation - stir so much noise? Dean Duda, a cultural theorist, author and professor at the Department of Comparative Literature at the Faculty of Humanities and Social Sciences in Zagreb, once suggested that it is absurd that we have a Ministry of Science, Education and Sport, as if education should not have a sector of its own, dedicated to its growth as a precondition for higher education and scientific development, and that if there is in fact a sector with which it could be merged, it should surely be the culture sector. Because culture, and this is now my interpretation, does not have a firm base. And its base is definitely in the educational system – pupils and students are taught to seek impulses from the outer world, to counterpoint the teaching materials with experiences from everyday life, to question what they see and hear and to find alternative sources of information. Or – at least – that’s what they should be doing. If they do not, they depend solely on the institutional support that will impose those imperatives on teachers but also introduce and implement such practices, from assuring that pupils attend and participate in cultural activities by financing their learning, to supporting every local initiative that upgrades the learning process. Unfortunately, it is not just that the Ministry of Science, Education and Sport does not provide that kind of support, in many cases it resists its own educational policies. The former government introduced a pilot programme of cultural activities performed by associations and artistic organisations from the independent cultural scene, directed towards elementary schools and high schools, but the programme was not implemented, guided or monitored properly, so there are no analyses about its benefits. The new minister decided to announce a call for the same programme under the European Social Fund, and not the national budget, but the call has not yet been published. The Ministry of Education has recently released an invite for civil society organisations' educational programmes in schools, and that is the furthest the relationship between culture and education has gone in the institutional context. This is why the Croatian society needs a curricular reform, among other reasons. From the inside it relies on the enthusiasm of individual teachers, which is not sustainable, especially considering the fact that teachers are themselves educated in the same system that does not link the two sectors. In the Croatian context, cultural policies are undoubtedly connected to past issues, issues of education and of public interest and of public goods. In the context of civil society organisations, civic culture has been an important part of it, active in local communities where organisations for the protection of rights, associations for youth, women's rights or ecology, educational or health services, were just forming. At this point, there is a cultural organisation in almost every local community that can work from the inside. An important episode in Croatian past relates to the situation evolving at present day. The government’s irresponsibility has been triggering mass discontent from the end of the 1990s, and the removal of the government was initiated by a broad civic mobilization. As the sociologist and activist Srđan Dvornik writes, on one side there was a regime that had everything under control, but no base to hold power, and on the other there was mass discontent. And right in the middle - hundreds of civil society organisations which would never have been able to run such a crowd, but were capable of organisational support. The exact same thing happened behind the scenes of the massive protests that have marked June 1st. Anger, the first step towards articulation of the problem, has to be organised in order not to become self-pleasing but productive. The mobilisation, channelling and organisation of an idea for a better future towards a movement that cannot be stifled, is exactly what the Croatian civil society has to offer to those kids, pupils and students who gathered in public spaces in defence of public interest. For many of them, this was the first protest they attended. If culture, cultural movements and other individual and group players could embrace a "depoliticised" educational system as the starting point where critical, progressive and experimental cultural practices can be nurtured, there is a possibility that those practices will retain its addressees. Only from that point onwards can that system, with its practitioners and users, accept the political as a way of operating, as a way of forming the base for the reproduction of critical, progressive and experimental ideas. Yes, we all know that it is not possible for educational systems to avoid being ideological, but only through cultural education can that idea become prevailing. Developers of the curricular reform, the teachers, have invited engaging cultural practices into the educational system; there is only the effort of responding to the invitation. Since the possibilities in the institutional context are scarce, if anything, cultural organisations could join teachers and educational organizations in the common struggle of breaking down the government's barriers to an educational system that is free, just and accessible to all. This is a digest version of an article first published as Channelling anger and depoliticizing happiness. The text was published through Connected Action for the Commons's website, a network and action research programme initiated in 2013 by European Cultural Foundation (ECF) together with six cultural organisations from across Europe. This version of the article was edited by Olga Alexeeva and Szilvia Kochanowski and proofread by Tomislav Žilić.